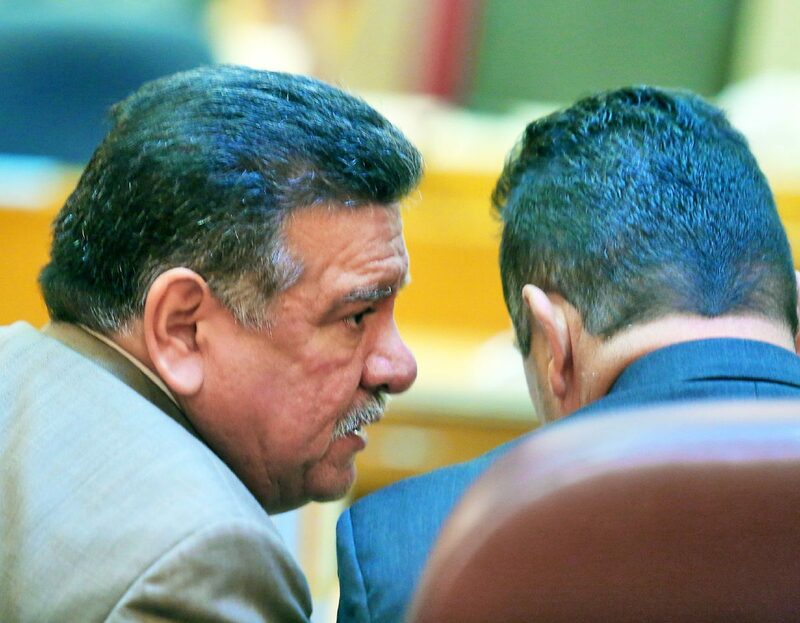 EDINBURG — Jurors in the Eloy Alcala capital murder trial, which began Wednesday, have only heard from one witness thus far, the first Pharr police officer to arrive to the scene of an October 2010 double homicide. Alcala’s defense team cast Pharr police investigator Enrique Ontiveros, who was a patrol officer at the time, as responsible for changing the direction of the investigation such that it led to Alcala, 51, and his son, Eloy Jiovanni Perez Alcala, 29, who juries convicted for the murder of David Garcia and Victor de la Cruz in 2012 and 2011, respectively. The elder Alcala was awarded a new trial on appeal in 2014. Ontiveros testified Thursday that police dispatch initially described the suspect vehicle as a gray truck, based on a 911 call the department received in the wake of the shooting, which happened before 1:30 a.m. on Oct. 8, 2010. Upon speaking with a neighbor who lived across from the intersection where Garcia and de la Cruz were shot, Ontiveros radioed to the department that a white Dodge Ram pickup truck had been seen leaving the scene and advised officers he believed the suspect vehicle was still in the Las Milpas subdivision where the shooting occurred. Defense attorney Jaime Alemán questioned Ontiveros about dashcam footage captured as he was driving toward the subdivision that showed him passing another vehicle on the road just blocks from the scene. “Is it possible that we’re looking at a truck?” Alemán asked of the vehicle, of which only a large headlight can be depicted by the video. Through his questioning of the investigator, Alemán emphasized to jurors that police did not search for other vehicles aside from the Dodge Ram and did not secure surveillance video from the area. Rather, based on a conversation officers had with Garcia’s family members, who arrived on the scene minutes after Ontiveros, police headed toward the Alcalas’ house upon learning the younger Alcala and Garcia had been fighting earlier that morning at the Garcias’ house. This is where they found the truck in question and detained both father and son for questioning, ultimately arresting them on capital murder charges. Ontiveros returns to the stand Friday for the third day of a trial expected to stretch well into next week.